In episode 58 Keetria talks with Jasmine Chigbu, CEO and Founder of Minorities to Majorities. Jasmine´s goal is to make higher education more accessible to minorities. After spending too much time searching for opòrtunities, she knew there had to be an easier way. Join Keetria and Jasmine as they talk about the movement she is creating and the journey of a minority entrepreneur. 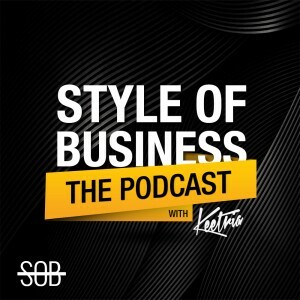 There’s also 15% off all MTM merchandise with promo code “STYLEOFBUSINESS.” Listen to the show! The app is all about giving people access. There is no barrier to download the app. Jasmine created an app Minorities to Majorities that allows students to access resources at the tips of their fingertips. Jasmine is making higher education more accessible for everyone and in the long-term healing individuals and communities through higher education. – “Communities and people can be healed through higher education.” – Jasmine. – “Do your research.” – Jasmine. – “Being an entrepreneur and being a black woman in the process has been a constant process of learning.” – Jasmine.